For those of you not blessed to live in an area that has access to the deliciousness that is Chick-fil-A, it is a restaurant. The food is quick, not fast, cost efficient, not cheap. They serve chicken almost exclusively and are slowly but surely giving fast food restaurants the elbow of death. The reason Christians love them is that the company is run with Christian values. By that I don’t mean they have a Jesus fish on their business card. They are closed on Sundays. This is perhaps the biggest statement that a company that stands to make tens of millions of dollars on the weekends can make about what the Sabbath means to them. There are no Bible verses inside the restaurant. The fries are called “waffle fries” not “Paul potatoes” or “trinity taters.” They aren’t overt in their faith but they weave it into everything they do and everything they do is great. Add all that up and Christians can’t wait to throw money at Chick-fil-A. My wife and two kids have eaten hundreds of meals there in the last few years and when I recently did a freelance writing project for them I would have hugged the president except it was a conference call and I had signed paperwork that I would not hug any executives. Hello?! You forgot to explain the best part of Chick-fil-A for your non-Southern readers! The cow signs! You simply must add some cow details here! 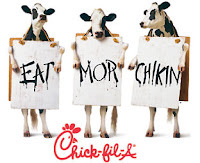 I don’t eat at Chick-fil-A, but I heart them because of their cow signs and throw money at children selling their cow-themed fundraising calendars and then give them to frenz and fam. I mean, I can be exhausted and depressed driving home late at night from work, but driving past the electric shifting-sign on that building in Midtown off the southbound Connector makes me feel happy. I consider that real Christian of Chick-fil-A. However, while I would normally agree that Bible verses on fast-food dinnerware is bad form, SoCal’s IN-N-OUT Burger is an exception. Their burgers make you so happy that you’re just fine with seeing Jeremiah 29:11-13 on the bottom of your paper cup. “I love Chic-Fil-A…” I sing this to the tune of I Love Rock and Roll often. Still working on more words to the same tune though. I also fondly remember In N Out when I was out in LA… for a band trip. You didn’t even side-hug Mr. Cathy, Jon? Is it necessary to pray before eating a Chick-fil-A meal, or is the food there intrinsically blessed? Sigh. The nearest Chick-Fil-A is in Northern California, a mere seven hours away. When I travel out of state, I actually find out where the restaurants are so I can get my chicken fix. I was under the impression that the reason behind Chick-fil-a being closed on Sundays wasn’t a God-centered one. I thought that it was a decision the owners wife made so they could have family time. I like Chick-fil-a as well. The ones in our area are a little overt in that they play the contempory ‘Christian’ music in their stores. But, the one down the street from us has some of the nicest staff that you could ask from a fast food establishment. Late to the game here — I'm in L.A. so no Chick-fil-a… We do have In 'n' Out, and I'm surprised no one has mentioned their secret menu. My son is crazy about animal style fries. No, they don't have Bible verses on the walls, but the Chilck-Fil-A I worked at in high school had "God's Command: Thou shalt not steal" on the cash registers. It made me laugh. one thing you forgot to mention. they deep-fry in devil sauce (aka peanut oil). sadly, some of us can never eat there without certain death. i suppose that is our cross to bear. Hmm, I'm an agnostic who loves Chik Fil A. Sigh. christian means “Christ Like” Jesus never called anyone out or called them a bigot. He shared his compassion and love with all and actually gave us a living example of how to treat the lost by dining with tax collectors, witnessing to non Christians, etc. It is easy to judge, and in turn, turn people off to the whole idea of Christ and his teaching through bad non “Christ Like” Christian behavior. Go home and take a peek at that little book gathering dust and show some love and compassion rather than judgementalness (yes i made that word up). More wars are won through love and listening than through flapping your jaws. Oh! And the workers are so incredibly polite! They always say, "My pleasure" when you thank them for something! How is some place like this not in Grand Rapids, MI? i think there will be both … i mean, come on. this is the home of the god who made chickens AND cows, so both will get equal time. and there will be chipotle (paying for chips is worth is b/c the guac is SO MUCH BETTER than moe's. say no to moe's!). Ok, better late than never, but I have something to share. Recently I have learned that in Chandler, Arizona, (Southeast of Phoenix) there will be both an In-N-Out and a Chick-fil-A very near each other. The former has been there for a few years, I'm guessing the latter will be finished with construction by January or February 2010. Should you ever want to try both on the same day or want to avoid some sort of schism between your friends, they are at the Northeast corner of the 101 freeway (aka Price Rd.) and Chandler Blvd. This has been simulposted to the In-N-Out discussion. WHY do I live in Seattle?! We don't have Chick-Fil-A OR In-n-out. I only found out that they existed last summer!! chick fil a is not a christian company. I worked there once and the management treated me badly and I was just a teen.